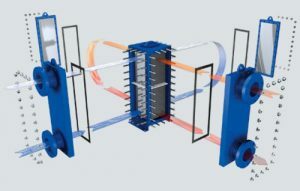 The plate and frame heat exchanger is a compact and efficient heat transfer solution for a wide variety of applications in practically all industries. Sealed with gaskets, the plate and frame heat exchanger works with a low pressure drop whilst maintaining high turbulence across the plate surface for maximum heat transfer. 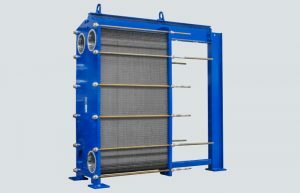 The plate and frame heat exchanger provides easy maintenance due to its ability to be disassembled, allowing cleaning, servicing and replacement of parts if required. 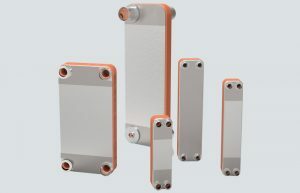 The fully welded plate heat exchangers contain more robust plates with greater thickness, allowing suitability at higher temperature and pressure ranges. Minimal in size, they still pack a punch with outstanding heat transfer coefficients and comparatively minimal investment costs. They are particularly robust and require minimal cleaning and service. Our fully-welded plate heat exchangers offer convincing performance, even under the most difficult circumstances.